Brimming with tomatoes! We squeeze more than 30 of our Italian sun-ripened tomatoes in each bottle! 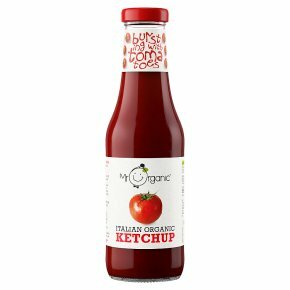 - Great Taste Awarded - Organic & Natural - Vegan & Vegetarian - Gluten Free - BPA Free Packaging - Zero Air Miles Great Taste award-winning Tomato Ketchup packed full of juicy, organic sun-ripened tomatoes! All our ketchups are made at our own sustainable production base next to our farms in Italy using our own sun-ripened tomatoes and we can track each tomato back to the field in which it was grown. We build long-lasting relationships with our farmers and when it comes to selecting our food, we make sure that only the best goes inside our jars and tins. To top it off, our tomatoes are always packed within a few hours of harvest, keeping their flavour and freshness fully intact. From seed to jar, we take care of it all! All Mr. Organic food is made with organically grown ingredients and love for our planet.